Sharing is caring, but Windows 10 may have pushed the sentiment a little too far. A new feature in Windows 10 is called WiFi Sense, and it aims to create a network of shared hotspots between you and your contacts. 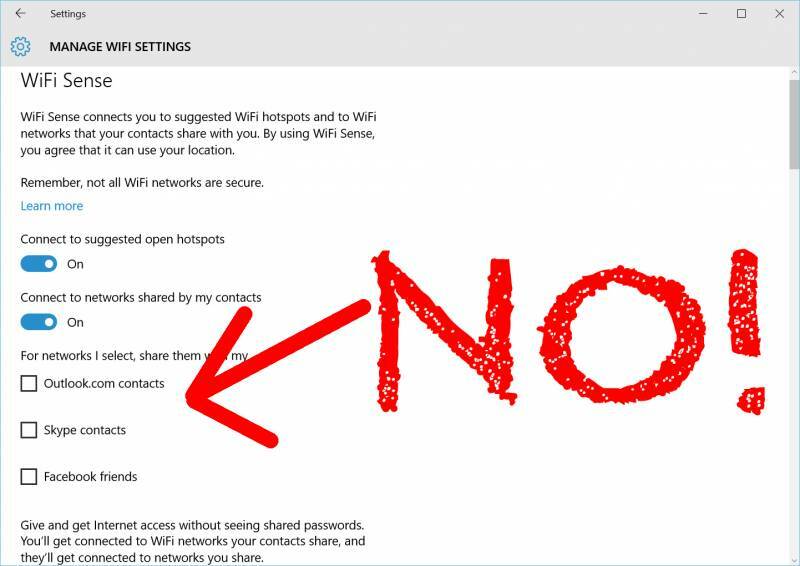 Unless prompted otherwise, the OS will share your WiFi passwords, albeit encrypted, with your Outlook, Skype, and Facebook friends and contacts. This means whenever they wander within range of a hotspot you’ve previously logged in to, they will automatically have access. And this is enabled by default. In order to avoid this, you have to know about it in the first place. Spread the word! Open the Settings app by clicking on the Windows Start icon and open the Settings app. Go to the Network & Internet group of settings. In the WiFi tab, scroll down until you see ‘Manage WiFi settings’. Click to open. You will see an option that says, ‘For networks I select, share them with my’ and then follows a list of contact groups that your WiFi will be shared with for selected connections. Uncheck each one of the listed group of contacts. – Outlook.com, Skype and Facebook. To be extra safe, you should probably turn off the ‘Connect to networks shared by my contacts’ option as well so that you aren’t connected to a network shared by a contact because there’s a chance the connection might not be safe. This is basically how you opt out of WiFi Sense and this works provided there is no other Windows 10 device connected to your network. If there is, each one of those devices needs to opt out of sharing the WiFi. Of course, you still have the option to share your home WiFi with whoever you want to.